We’d love your help. 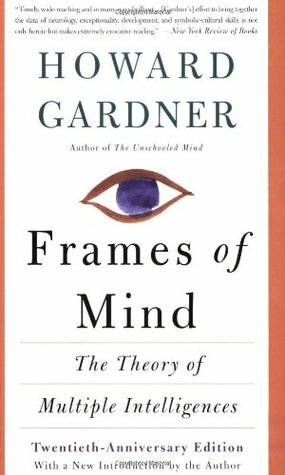 Let us know what’s wrong with this preview of Frames of Mind by Howard Gardner. A revolutionary challenge to the widely held notion that intelligence is a single general capacity possessed by every individual to a greater or lesser extent. Gardner's trailblazing book revolutionized the worlds of education and psychology by positing that rather than a single type of intelligence, we have several--most of which are neglected by standard testing and educ A revolutionary challenge to the widely held notion that intelligence is a single general capacity possessed by every individual to a greater or lesser extent. Gardner's trailblazing book revolutionized the worlds of education and psychology by positing that rather than a single type of intelligence, we have several--most of which are neglected by standard testing and educational methods. More than 200,00 copies of earlier editions have been sold; this reissue includes a new introduction by the author to mark the twenty-first birthday of this remarkable book. To ask other readers questions about Frames of Mind, please sign up. If nothing else, Gardner forces the attentive reader (pro or con) to re-evaluate how we teach people and if he's caused us to do it better, then I wrote a paper on Gardner's theory of multiple intelligences when I was working toward my master's in education. This is one of those books on which many people opine who have not actually read it. Accordingly, we tend to see people scorning the theory of multiple intelligences, arguing that really "these are just skills rather than separate intelligences". As you may imagine, this book, the harbinger of the theory in 1983, goes rather further in delineating what we can call an intelligence by looking at our history of understanding intelligence and trying to come to a picture of what could really constitu This is one of those books on which many people opine who have not actually read it. Accordingly, we tend to see people scorning the theory of multiple intelligences, arguing that really "these are just skills rather than separate intelligences". As you may imagine, this book, the harbinger of the theory in 1983, goes rather further in delineating what we can call an intelligence by looking at our history of understanding intelligence and trying to come to a picture of what could really constitute a discrete intelligence. "Gall proposed other pregnant ideas, among them this fascinating claim: there do not exist general mental powers, such as perception, memory, and attention; but, rather, there exist different forms of perception, memory, and the like for each of the several intellectual faculties, such as language, music, or vision." "creativity should be thought of as emerging from the interactions of three nodes: the individual with his or her own profile of competences and values; the domains available for study and mastery within a culture; and the judgments rendered by the field that is deemed competent within a culture"
The same way we consider that people can be "at risk" of a particular disease, Gardner argues, "it may be useful to consider certain individuals as “at promise” for the flowering of a certain talent. Again, this diagnosis does not ensure that they will develop the talent"
Gardner posits this understanding of the intelligences as a way to know how to educate and strengthen humans and their abilities, but he also makes a nod to a major elephant in the room: the desire to learn, which can be seen as a clear common factor in high achievers. Where does that come from? Is it purely chemical/mechanical? Or is it cultural or specifically needs-based? Those of us working with MI more as a student profiling tool and personalisation aid all come across the issue of the motivation factor and have to decide on its provenance. Is it the coursework failing the student? Is it the individual’s lack of desire? Is there really not enough time in the day? While there is no simple answer to this search for what we might term the “soul of learning” - at least not in this book - there is a strong case for scraping away certain examples of accepted wisdom, particularly in terms of memory and numerical skills, and looking more holistically at the human in front of us. Gardner's view is that "each form of intelligence has a natural life course: while logical-mathematical thought proves fragile later in life, across all individuals, and bodily-kinesthetic intelligence is also “at risk,” at least certain aspects of visual and spatial knowledge prove robust, especially in individuals who have practiced them regularly throughout their lives. There is a sense of the whole, a “gestalt” sensitivity, which is central in spatial intelligence, and which seems to be a reward for aging—a continuing or perhaps even an enhanced capacity to appreciate the whole, to discern patterns even when certain details or fine points may be lost. Perhaps wisdom draws on this sensitivity to patterns, forms, and whole." Indeed, he sums up his argument by stating "(s)omewhere between the Chomskian stress on individuals, with their separate unfolding mental faculties, the Piagetian view of the developing organism passing through a uniform sequence of stages, and the anthropological attention to the formative effects of the cultural environment, it ought to be possible to forge a productive middle ground: a position that takes seriously the nature of innate intellectual proclivities, the heterogeneous processes of development in the child, and the ways in which these are shaped and transformed by the particular practices and values of culture." In other words, a more hands-on approach to exploring these proclivities and capacities, which digs among the subtleties to find what it is that makes us tick better. There are capacities which unite us and are totally comparable (take that, Chomsky) and there are personal applications due to culture or opportunity which far outstrip the same raw material seen in others (stop your smirking, Piaget). Gardner's work is one of the great rebuttals to those who advocate the use of standardized testing scores as an appropriate measure of teaching and learning. It opened my eyes. Such an interesting read. So helpful for anyone involved in the development of a child. It seems a little more relevant to parent compared to teachers. There seems to be a misconception among educators that this is a book about how "Everyone Learns Differently." It is more about how there are different intelligences which can be nurtured separately and many of them are ignored. Gardner is a better researcher than he is writer. The content is interesting, but it takes effort to read. It is worth reading since this is the original theory that everyone refers to. This books presents a useful way to view intelligence. It acknowledges that some people are smarter in one area than in another. I don't entirely agree with his categories, but the notion is useful, as it prevents a person who is talented in, say, dance, from being considered stupid because that person is maybe not so good at linear logic chains. Those training to be schoolteachers will often be required to read this book. That's a good thing. It would be nicer still, though, if people would loo This books presents a useful way to view intelligence. It acknowledges that some people are smarter in one area than in another. I don't entirely agree with his categories, but the notion is useful, as it prevents a person who is talented in, say, dance, from being considered stupid because that person is maybe not so good at linear logic chains. Those training to be schoolteachers will often be required to read this book. That's a good thing. It would be nicer still, though, if people would look at this book, take its ideas, and use them to direct themselves to areas in which success is more likely than it would be in another direction. This is a very good book about human minds and capacity. I was like super inside the book. I read about the Theory of Multiple Intelligences for school and got interested and keept reading. 4.57 Self: You have a very good sense of self. You like to spend time by yourself and think things over. You will often take in information from another person, mull it over by yourself, and come back to that pe This is a very good book about human minds and capacity. I was like super inside the book. I read about the Theory of Multiple Intelligences for school and got interested and keept reading. Listen to and read "how to" tapes and books. Arrange cartoons and other pictures in a logical sequence. Sort, categorize, and characterize word lists. While reading a story, stop before you've finished and predict what will happen next. I swear I do this one. Explore the origins of words. Play games that require critical thinking. For example, pick the one word that doesn't fit: chair, table, paper clip, sofa. Explain why it doesn't fit. Work with scrambled sentences. Talk about what happens when the order is changed. After finishing a story, mind map some of the main ideas and details. Write the directions for completing a simple job like starting a car or tying a shoe. Make outlines of what you are going to write or of the material you've already read. Look for patterns in words. What's the relationship between heal, health, and healthier? Look at advertisements critically. What are they using to get you to buy their product? Early in the book, I was quite intrigued with the idea of Gardner's theories, but as he explained his multiple intelligences, I lost interest. At first go through, I don't agree that music, body-kinesthetic or even language rate as different intelligences...spatial, maybe; math maybe; "personal"? I've come to understand that is a "yes" (thank Goleman for branding that emotional intelligence) Obviously, there are people more skilled than others in the different areas, but scales of intelligence? Early in the book, I was quite intrigued with the idea of Gardner's theories, but as he explained his multiple intelligences, I lost interest. At first go through, I don't agree that music, body-kinesthetic or even language rate as different intelligences...spatial, maybe; math maybe; "personal"? I've come to understand that is a "yes" (thank Goleman for branding that emotional intelligence) Obviously, there are people more skilled than others in the different areas, but scales of intelligence? I say no. Now, I should note that I scored high in the past on so-called IQ tests.., but I think those are skewed, culturally, if not in other ways - language associations, spatial orientations, etc are not in my opinion reflective of intelligence (and if course, I'm not a researcher in the field, so that is opinion only for any future trolls who want to argue with me.) There are so many highly intelligent people who cannot solve the problems posed on standardized tests, and yet are extremely adept at problem solving. That is what I consider a true measure of intelligence...not the ability to use/understand music, math, language, etc. The abstract concepts of math might be the exception to my generalization - there has to be intelligence to manipulate the symbols. The ideas were interesting but it was really dry, and I am not sure that he made the case that these should could as unique intelligences, though having read it years ago, I may have been more convinced then. The most interesting idea to me, and I think I got it from an article inspired by the book where it was highlighted at a level not in the book, was that if you can teach things with techniques that bring in multiple intelligences, then you can reach more students, including the non-traditio The ideas were interesting but it was really dry, and I am not sure that he made the case that these should could as unique intelligences, though having read it years ago, I may have been more convinced then. The most interesting idea to me, and I think I got it from an article inspired by the book where it was highlighted at a level not in the book, was that if you can teach things with techniques that bring in multiple intelligences, then you can reach more students, including the non-traditional learners. Necessary reading for all educators. Howard Gardener is a staple in education these days, and this book discusses the various types of intelligence (although I'm not sure if this version is updated with natural intelligence 2002 or so, and the emotional intelligence 2005 or so). Every student talents in different areas, and we can use this talent to help the child grow and learn in a way they'd benefit most from. I read this while doing my MBA. I saw it as a reference in a newspaper article. A great read and very insightful of peoples attributes. It really allows oneself to view your own personality and attributes under different perspectives. This is book that all talent scouts and HR managers should read. Not for beginner readers, it will take time to digest this monster. However, when you are finished, you will feel absolutely satisfied. Intrigued me at the time. Curious now what geneticists are discovering that might fit the theory. Part 1: intelligence testing has been stuck in one mode for a really long time and we should expand our minds and think about it differently. intelligence likely has some biological reason, but we don’t know what it is. Intelligence should be defined/limited as follows: isolated and distinct, identifiable operations, has an evolutionary and developmental history and an expert, can apply the scientific method to test it, and communicate it through symbols. Intelligence is not always a positive tr Part 1: intelligence testing has been stuck in one mode for a really long time and we should expand our minds and think about it differently. intelligence likely has some biological reason, but we don’t know what it is. Intelligence should be defined/limited as follows: isolated and distinct, identifiable operations, has an evolutionary and developmental history and an expert, can apply the scientific method to test it, and communicate it through symbols. Intelligence is not always a positive trait or is only used for good and is more know-how than know-that. Part 2: Gardner’s proposal for a number of specific intelligence and argument thereof. 1. Linguistic intelligence- written, spoken, read language including poetry, oration, early reading. 2. Musical intelligence- performing, singing, composing, playing, interpreting, listening/identifying, even accompanying dance. 3. Logical-mathematical intelligence- conventional intelligence based on reasoning and abstract concepts. 4. Spatial intelligence- I’m going to describe this as imagination, but maybe more picturing things in your head. I think drawing falls under this category too. And reading maps and sense of direction. 5. Bodily-kinesthetic intelligence- use of the body as an athlete, dancer, actor, mime. He thinks using tools and hand-eye coordination falls here. I think that it’s own category. 6. Personal intelligence- both interpersonal and intrapersonal. I’m not sure how to define the expert in these. This guy is kind of douche with his sexist and racist comments. And I don’t disagree with his proposal, but I think he’s missing a lot of intelligences. Like systems, processes, cause-effect, or would that fall under number 3? He seems to put in number 5. I think it’s separate. Or maybe it’s the opposite and that each intelligence he proposes overlaps with the others. Either way, this will always be subjective. I wanted to read this book (35 years old now) because it was recommended by my Mensa test administrator 5 years ago. I missed the mark by 1% and he pointed out the limitations of the exam and recommended this book. I think the most important lesson to glean from this is that everyone has something to offer the world. Chapters 11 and 12 are much more in agreement with my thoughts and feelings. I appreciate the theory, but the book is a tedious read for the layman. The book is really geared towards psychologists or educators. I came across some of Gardner's writings on his M.I. Theory two years ago. I've been wanting to read the whole book ever since. I loved the fact that the author challenged the prevailing notion of a single intelligence assessed by a one-hour paper-and-pencil test (the so called IQ tests), coming up with a more comprehensive approach to human cognition and its potential usefulness in education. Amazing. Simply amazing. And true. How is that the aplications of these great ideas came to be not the ideas per se but whoever's interpretation of them? Interesting concepts but dry and a little wordy. Some of this was new material to me, but most of it was not due to my background in education. The title of the book is self-explanatory. You don't need to read this 496 page book, you could look up blogs and article on it, written by Howard Gardner. A great book indeed, focuses on how flawed our education system is, how it only focuses on cognitive abilities of a person and not other intelligences. Howard Gardner is a professor at Harvard. His controversial theory of multiple intelligences suggests that there are at least seven distinct types of human intelligence, not just one. The book was interesting, although the first two chapters are really all I needed to read to get the gist of it. The rest is academic iterations of the same material, or results from field research. 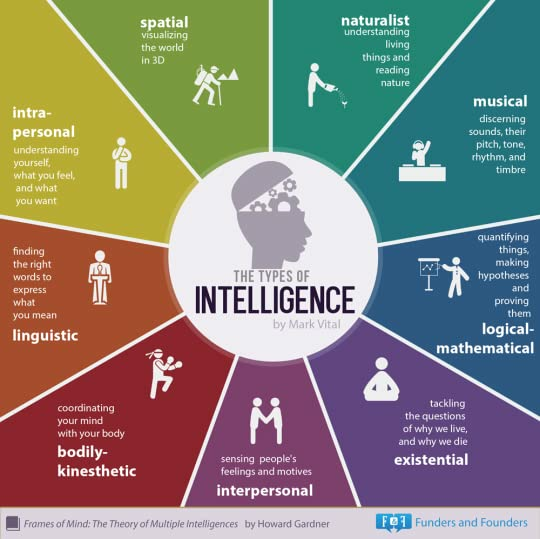 I think the idea of multiple intelligences is interesting, but Gardner's theory is unproven thus far, and it critique Howard Gardner is a professor at Harvard. His controversial theory of multiple intelligences suggests that there are at least seven distinct types of human intelligence, not just one. I think the idea of multiple intelligences is interesting, but Gardner's theory is unproven thus far, and it critiqued by a whole lot of psych-ed people in the field. I do like his idea of an "individual-centered school" including developing customized curriculum for each student based on their strengths and weaknesses. Howard Gardner is the John H. and Elisabeth A. Hobbs Professor of Cognition and Education at the Harvard Graduate School of Education. He also holds positions as Adjunct Professor of Psychology at Harvard University and Senior Director of Harvard Project Zero. Among numerous honors, Gardner received a MacArthur Prize Fellowship in 1981. He has received honorary degrees from 26 colleges and univers Howard Gardner is the John H. and Elisabeth A. Hobbs Professor of Cognition and Education at the Harvard Graduate School of Education. He also holds positions as Adjunct Professor of Psychology at Harvard University and Senior Director of Harvard Project Zero. Among numerous honors, Gardner received a MacArthur Prize Fellowship in 1981. He has received honorary degrees from 26 colleges and universities, including institutions in Bulgaria, Chile, Greece, Ireland, Israel, Italy, and South Korea. In 2005 and again in 2008, he was selected by Foreign Policy and Prospect magazines as one of the 100 most influential public intellectuals in the world. The author of 25 books translated into 28 languages, and several hundred articles, Gardner is best known in educational circles for his theory of multiple intelligences, a critique of the notion that there exists but a single human intelligence that can be adequately assessed by standard psychometric instruments.